Hello friends, Today I will tell you a method on how to uninstall Windows 10 updates. Users can uninstall Windows 10 Updates from your Windows PC/Laptops. You can uninstall Windows updates when your computer is not starting. I will share a tweak to enter in a mode and remove all your Windows 10 updates from Windows 10 PC/laptop. You can delete all files of Windows 10 upgrade. 0.1 What is Windows Update? Windows Update is a service which is offered by Microsoft Windows. In this service, developer and engineers rollout the new version of Windows based on several operating systems such as 7, 8, 8.1 or 10. These updates are to fix the system bugs, modifications in system settings, changing the user interface, and much more. A Windows user could install or uninstall Windows updates manually if he/she didn’t like it. Sometimes, these updates create a minor problem Windows thus it gets fixed in the new update. In the recent Windows OS that is Windows 10 the Windows updates were very critical though, many users have uninstalled Windows 10 updates. Fixing bugs, problem and other things always take place in the form of Windows update. Windows updates are the worst nightmare of a Windows user. Many of us always wanted to get rid of this Windows update. However, the Windows update is the thing which is done by itself without even asking from us. Well, sometimes we don’t like the update which we got through the regular Windows updates. Also, if we talk about Windows 10 operating system, then the updates are the thing which we must consider as a critical issue because our system may or may not work well with the newest update. Thus, to uninstall Windows 10 updates which you don’t like or you may say which is not suitable for your system can be easily uninstalled using this guide. Follow the below step by step guide to uninstall Windows 10 updates. Now, click on Programs and features. From the left-hand side, click on View installed updates. Now, you will see a list of all Windows updates (Microsoft Windows) over there. Select the update which you want to uninstall. Lastly, click Uninstall to uninstall Windows 10 updates. This is the best method ever to uninstall Windows 10 updates. However, if you don’t know that what correctly the Windows updates are then you must check the above part of the article. There is no other way to uninstall Windows 10 updates. But, this is the official way to uninstall Windows 10 updates. Control panel is the main settings hub on our Windows 10 PC, and that will do it for you. 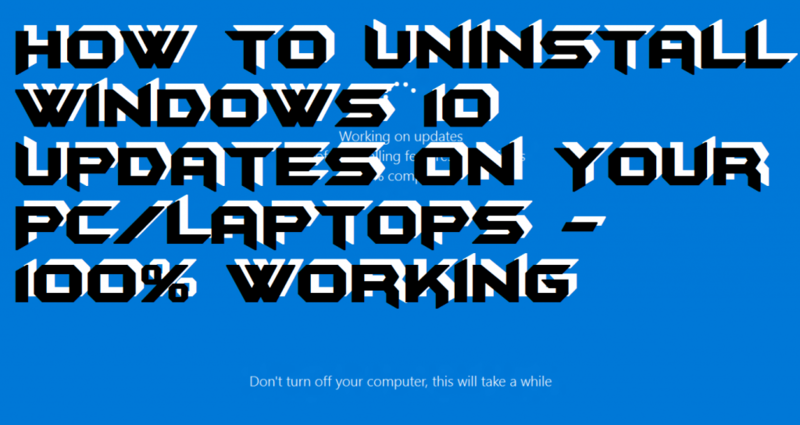 I hope using this article you now have an idea that how you can uninstall Windows 10 updates. Share this amazing article with your friends and relatives. Thus, they can also learn that how to uninstall Windows 10 updates on PC/Laptop.